That’s one of a number of negative comments about Realtors that appeared beneath an article recently published by The Washington Post. The subject of the article was the “DANGER report,” a sometimes-scathing study recently released by the National Association of Realtors that details potential threats to the real estate industry. That, along with other findings that paint an unflattering portrait of the industry, has sparked a debate among real estate agents about whether NAR should have released the study. While plenty of agents agree with many of the report’s conclusions, some worry that it largely validates many consumers’ negative perceptions of real estate agents. Others applaud the study as an overdue wake-up call that could spur much-needed reform. NAR commissioned the report “in the belief that it is healthy and helpful to hear what others are saying, especially those ideas that might be uncomfortable or disagreeable,” she said. Wiskerchen added that NAR did not widely distribute the report, but did “distribute it to all who participated with the understanding that the information would be shared and discussed.” NAR announced the report on its public Facebook page in late May. The report lays out 50 threats to five groups: agents, brokers, NAR itself, local and state associations, and multiple listing services. “Masses of marginal agents destroy reputation”; “commissions spiral downward”; “the agent-centric era ends”; and “the agent is removed from the transaction” are among the top 10 threats to agents cited in the report. Finding from NAR’s DANGER report. 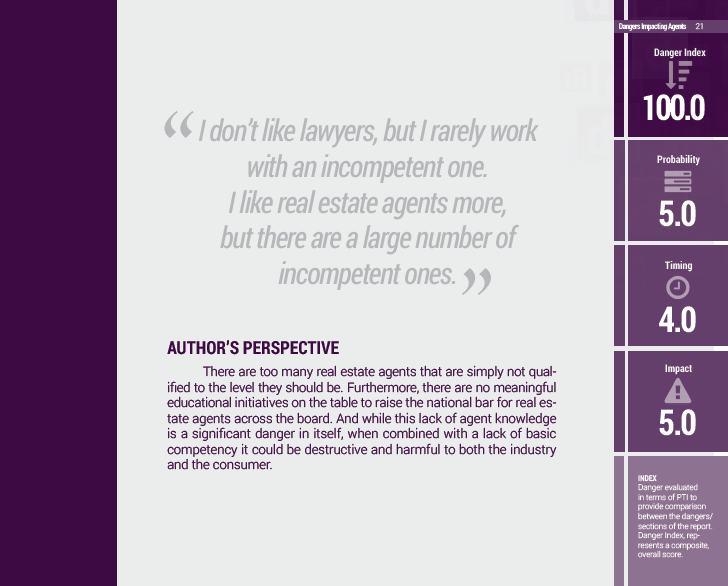 Those and other findings resonated with many in the industry, particularly the conclusion that subpar professionals are damaging the appeal of Realtors overall. Other agents who agreed with the report’s findings overall still found its tone and format somewhat abrasive, and questioned the value of releasing it to the public. “I’m a huge fan of transparency, vulnerability and speaking the truth, but this report screams of negativity, guilty conscience and pessimism,” said one commenter. Some critics said that they would have supported distribution of the report if it proposed solutions. “Airing our dirty laundry in public just gives the public justification for their already poor opinion of real estate agents unless there is a ‘so here’s what we plan on doing to improve things,'” said one commenter. But supporters argue that making the report public could nudge the industry in the right direction. “Awareness precedes change,” one commenter said. He added that, so far, “consumer commentary” on the report “is, in my opinion, largely from those that thrive on disagreement and controversy — and that’s OK, as that is the modern-day world of social media and public opinion we live in. “We are neither celebrating nor disappointed in the author’s perspectives,” she said.